In recent years, we’ve witnessed Montblanc – who acquired Minerva back in 2006 – embrace the storied bygone days of its Villeret movement manufacturer. They’ve developed innovative complications, and paid tribute with dressy heritage-style timepieces. And this year they’ve revamped their modern TimeWalker collection, keeping the contemporary styling, while paying tribute to the illustrious motorsport heritage of Minerva. Sitting amongst the simple three-handers and limited-edition rally timers of the collection is the TimeWalker Chronograph UTC. 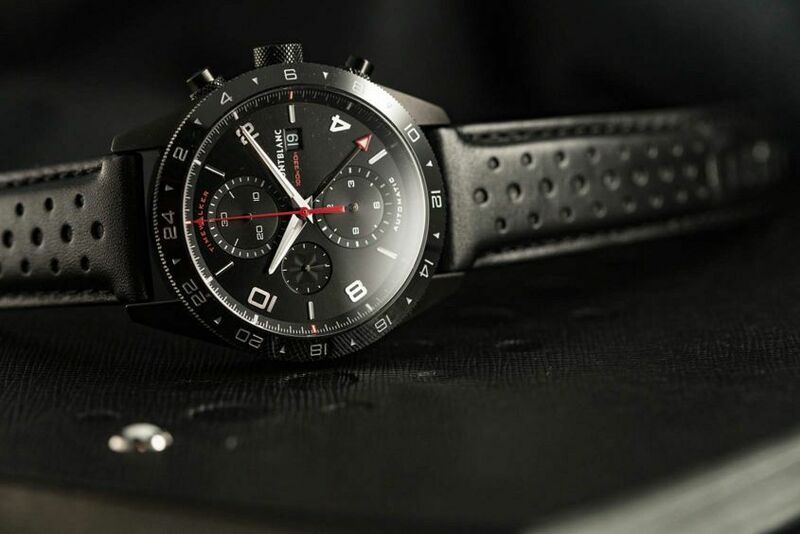 A sporty chronograph with a dual-time complication. What immediately sets the Chronograph UTC apart from the other TimeWalkers is its black DLC-treated 43mm case. Structurally it shares the exact same shape and semi-skeletonised lugs as the rest of the collection. Only bolder and blacked-out. The unidirectional ceramic bezel is engraved with a 24-hour scale – revealing its readiness to travel – and the bezel edge, along with the crown and pushers, is knurled – a functional finish common on vintage race cars. On the back is a smoked pane of sapphire crystal, uncovering the Calibre MB 25.03 movement beating inside. 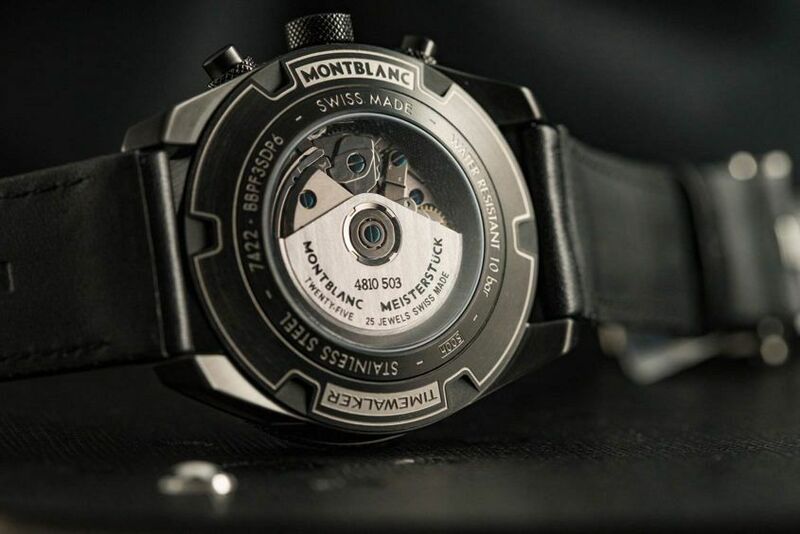 This is Montblanc’s variation of the ETA 7754, and has a power reserve of 46 hours. Water resistance is also a jaunty 100m. The dial continues the motor-racing theme. Laid out like an old dashboard, its black background is highlighted with elements of silver and red, with three stacked sub-dials dividing up the space between. 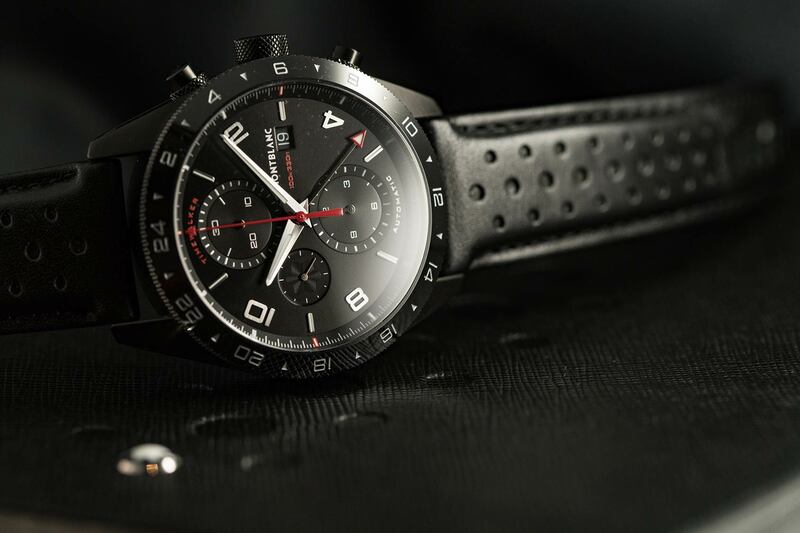 The elapsed hours and minutes of the chronograph are displayed at 6 and 12 o’clock respectively, and at 9 o’clock there is a small running seconds display. And indicating the chronograph seconds is a central red hand, tipped with the Minerva arrow. This new TimeWalker isn’t just a chronograph either, with multiple time zones displayed. Local time is shown by silver dauphine-style hands – the hour hand able to be independently adjusted in one-hour increments – and an additional hand, which is tipped with a red arrow, representing the second “home” time. Both are set by the crown, with the date only synced with local time. However, should you need it, a third time zone can also be shown by simply adjusting the bezel. 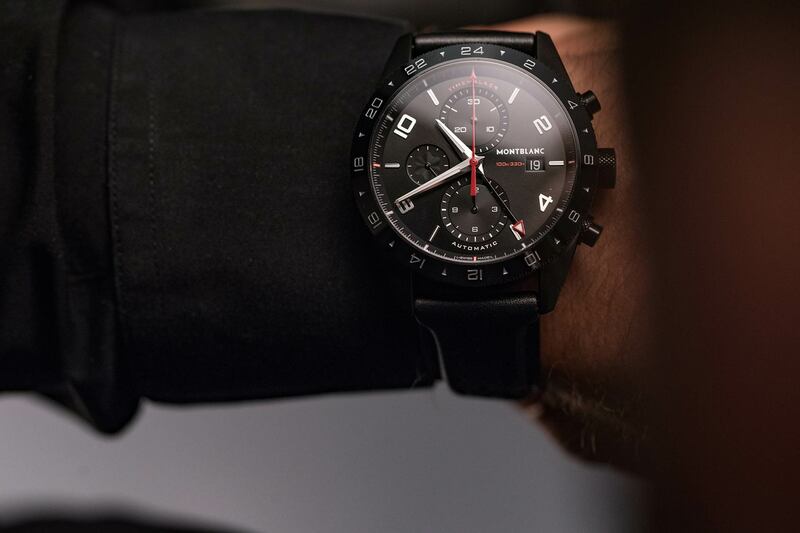 Each TimeWalker Chronograph UTC undergoes Montblanc’s Laboratory Test 500, which simulates the first 500 hours of real-world wear, and to strap it to the wrist is a choice of a perforated leather or rubber strap. For as long as there have been motor races, we’ve had chronographs to time them. The revamped TimeWalker collection not only reunites Minerva with its motorsports roots but also pairs two very useful (and popular) complications in the one watch.